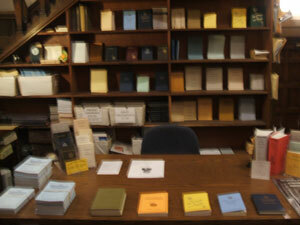 The United Lodge of Theosophists of Philadelphia offers books and publications available for purchase at the lodge. The materials are inexpensively priced to cover printing and shipping. This book, totaling more than 1300 pages in two volumes, was the first to issue from the pen of H.P.B., published in 1877. Isis Unveiled unites a historical review of religious and scientific ideas with the spirit of the quest for truth. Of special interest to the West is the investigation of the origins of Christianity, including exhaustive study of the teachings of the gnostic sects of the first centuries, and an explanation of the mystery of Jesus. The first truly scientific account of the vast subject of "Magic" is offered in this work, which has for its sub-title: "A Master-Key to the Mysteries of Ancient and Modern Science and Theology." Photographic facsimile of the Original Edition, the two volumes bound in one. In 1888, eleven years after the appearance of Isis Unveiled, H.P.B. completed and published The Secret Doctrine — “The Synthesis of Science, Religion and Philosophy.” The systematic character of this work is revealed by the subjects treated at length in its pages: Cosmogenesis, Cosmic Evolution, Anthropogenesis, the Evolution of Symbolism, the Archaic Symbolism of the World-Religions, Science and the Secret Doctrine Contrasted. The Secret Doctrine differs from Isis in that it deliberately unfolds a specific teaching about the nature of things. In the Introductory pages of Volume I, H.P. Blavatsky wrote: The Secret Doctrine is not a treatise, or a series of vague theories, but contains all that can be given out to the world in this century." The Secret Doctrine is, therefore, the basic source of the Theosophical teachings in this cycle. Facsimile edition, two volumes in one. The Key is especially valuable for its extended discussion of what happens after death and for the analysis of man's psychological nature. Theosophical books contain many unfamiliar conceptions, terms and allusions without adequate definition or explanation in available dictionaries and encyclopedias. The Theosophical Glossary, published in 1892, meets this need. The Glossary provides 389 pages of definitions and brief philosophical essays by H.P. Blavatsky on terms and subjects of the Theosophical teaching. This rendition into English of selected passages from “The Book of Golden Precepts” appeared in 1889, with the inscription by H.P.B., “for the daily use of disciples”. Of surpassing beauty in expression, it is a manual of devotion which thrills with the majestic purpose of the Saviors of mankind. In 1889, when H.P.B. was in London, the weekly meetings of the Blavatsky Lodge was devoted to the discussion of the archaic “Stanzas” on which The Secret Doctrine is based. Transactions provides 150 pages of H.P.B. 's answers to metaphysical and scientific questions, as stenographically reported, and afterwards revised by her for publication. It also includes an extensive treatise on Dreams. This book was first published in 1895 by the Theosophical Society as a memorial of H.P.B. 's life and work. It offers articles she wrote before the Society was formed, which appeared in the press of that day, in spiritualistic journals, as well as many which were published in the early days of the Movement in various magazines, including the Theosophist. Students wishing to become better acquainted with the spirit of the opening years of the Theosophical Movement in the nineteenth century will appreciate this volume (504 pages). The need for a simple, concise statement of Theosophical teachings was met by Mr. Judge with publication of this book in 1893. It first appeared as a series of newspaper articles, in which the writer set forth all the major doctrines of the philosophy, dealing with questions that might naturally occur to the average reader. Years of experience in the use of the Ocean as a text in Theosophical study classes have proved it a provocative approach to the Theosophical philosophy as a whole. It has 153 pages. Wm. Q. Judge's The Ocean of Theosophy in Spanish translation (paperbound). There are many translations of this Hindu scripture, but few, if any, can compare in either philosophical clarity or literary excellence with this rendition by Mr. Judge. The Bhagavad-Gita is often called the Bible of India. It is a portion of the Mahabharata (the great Hindu epic) and is recognized as embodying the highest and noblest truths of Eastern religious philosophy. These "Notes" are a companion to the Gita. Mr. Judge wrote seven of the articles. These, however, constitute more than half of the volume, the remaining chapters being written by Robert Crosbie, an associate and student of Mr. Judge. In the early days of the Theosophical Movement in the United States, Mr. Judge was in intimate contact with American students, with whom he maintained a large correspondence. Letters That Have Helped Me is a compilation of his counsels. Mr. Judge's wise and gentle words are a revelation of his understanding of the subtleties of human nature, and of the great depth and strength of heart he possessed as a teacher and a friend. This ancient treatise on self-control - sometimes called "Yoga" - is useful only to students with a thorough grounding in the Theosophical philosophy, for such knowledge on the part of the reader is assumed throughout. To this rendition of the Aphorisms of Patanjali, Mr. Judge has added brief explanatory paragraphs following many of the verses. The Theosophical Forum, a pamphlet-like periodical, was launched in April, 1889, and issued monthly thereafter to members of the Theosophical Society in America. It presented answers to Theosophical questions, written by various persons, and was sent without charge to branches and members. Only the replies by Mr. Judge (those which can be clearly identified) are included in this book, arranged in the sequence in which they originally appeared in the Forum, from May, 1889, through February, 1896. This is said to be the purest recorded form of Buddha's teaching, in a special Theosophical edition published in 1955. Here, published in one volume, are represented two of the great scriptures of ancient Theosophy. These, together with The Bhagavad-Gita and The Dhammapada, afford the student suggestive evidence that profound philosophy has always spoken a common language. Though this book is not strictly speaking an “ancient scripture,” no student of Gautama Buddha can fail to feel that Sir Edwin Arnold's epic poem, The Light of Asia, is a beautifully compelling and philosophically accurate rendering of Buddha's life and teaching. The writings of Robert Crosbie are included among the books belonging to the Theosophical literature for the reason that students have found them of great help in clarifying the teaching and as a practical guide in the Theosophical life. The Friendly Philosopher was compiled from his letters, talks and articles, published fifteen years after his death by appreciative students. For years Mr. Crosbie conducted classes in The Ocean of Theosophy. His comments and discussion on the Ocean were taken down by students and are available in this volume. Robert Crosbies's Answers to Questions in Spanish. There are two small books which were written down by Mabel Collins, a student of the last century. Light on the Path is a guide to the world of psychic experiences and Through the Gates of Gold is a short and simple treatise. Both bear internal evidence of occult teaching, and are to be studied simply for the practical guidance offered to students. A documentary history of the course of the Movement through its first seventy-five years - from 1875 to 1950. It is both a history and a critical evaluation of methods, attitudes and actions. The articles in this volume come from a variety of sources. They are presented here for their intrinsic worth to students of Theosophy. Also included is material from A.P. Sinnett's The Occult World, notes from Robert Bowen, a pupil of H.P.B., and notes of Countess Wachtmeister, apparently taken down from dictation by H.P.B. As the tide of interest in metaphysical and Eastern teachings grows, a spontaneous turning to reincarnation has seemed to result, providing a continuing harvest of human expression on this great subject. An extended discussion of the doctrine of rebirth drawing on our entire historical period, with plentiful quotations from modern sources and philosophies and religions of both East and West. Wherever there is a growing center of Theosophical work, the need is soon felt for materials appropriate for teaching the young. The Eternal Verities is a book for children, prepared after many years of experience. It is a book for the children themselves, containing lessons, illustrations, and many stories which embody the age-old ethics of the Wisdom Religion. This manual was designed for the use of parents and teachers, in connection with The Eternal Verities. It will be found an extremely practical aid in all phases of Theosophical education. General articles contributed by present-day students bring the light of Theosophy to bear on contemporary problems and suggest applications of the philosophy in terms of daily life. A department of survey and review, “On the Lookout”, discusses the relation between Theosophy and current thought in many fields of inquiry. The magazine maintains a correspondence department to aid students and inquirers on matters of Theosophical history and philosophy. Sample copy on request. Issued monthly. A bi-monthly magazine offering current articles on the Theosophical philosophy and the Theosophic life, and renditions and commentaries on ancient texts. Yearly subscription is 12.00. Order from: Vidya, 1407 Chapala Street, Santa Barbara, California 93101. Through the years Theosophy has made available to students the original periodical literature of the Movement, by publishing the articles written by H.P.B. and Mr. Judge. All these articles are available in book form, under the title, Theosophical Articles. The articles of Mr. Judge are available in two volumes, with a subject index; the articles of Madame Blavatsky are in three volumes, also with index. These books are invaluable reference works, prepared for the benefit of serious students. By H. P. Blavatsky (set of three volumes), cloth. By Wm. Q. Judge (set of two volumes), cloth. Individual pamphlets consisting of these articles are available at 2.00 each. (Order a list of Periodical Literature of the Theosophical Movement.) Two Replies by Wm. Q. Judge in connection with “Issues in the T.S.” (27) is also available at 4.50. By H. P. Blavatsky, this pamphlet consists of her letters to several Theosophical Conventions in the United States. These “Messages” are valuable as statements of the general purposes of the Movement and as guides in carrying on the work. Paper plaque Available upon request. This catalog is also available from The Theosophy Company.